Hollywood might make you believe that only covert military operatives require night vision binoculars, but in reality, these useful devices come in handy for many situations. From scouting hunting areas to hiking after dark, investing in a good pair of night vision binoculars opens up a whole new world and allows you to see your surroundings like never before. It is also a vital safety tool for anyone that spends their time boating in the dark or indulging in some nocturnal hiking. As with any high-tech gadget, it is possible to spend a lot of money on night vision binoculars and still end up with something that will leave you dissatisfied, so doing a bit of research beforehand can save you a lot of trouble in the long run. The number one thing to look out for in night vision binoculars is image quality. After all, the main purpose of the binoculars is to enhance your own vision and to see in lighting conditions that would normally be impossible to the naked eye. Most common night vision binoculars still use generation 1 technology, which is larger and heavier than newer generations, but also much easier on the wallet. Some manufacturers might opt for cheaper optics or fewer intensifier tubes to save costs, but this will naturally be reflected in the image quality. Comfort and ease of use are also factors that should be taken into serious consideration as you will more than likely be operating the binoculars out in the wild. Binoculars that are not comfortable to hold or require fumbling around in the dark to operate properly are going to be a nuisance outdoors and might make you regret your decision. The best binoculars for the job will also be durable enough to withstand the wear and tear of everyday use, so pay attention to the material that the equipment is made from and how resistant they are to the elements. After determining what you want from your new night vision binoculars and what you are willing to spend you can look at the available options to see which ones match your expectations. Take a look at our top ten picks below to see what we think are some of the best offerings currently available on the market. The very aggressive styling is the first thing you will notice when you unpack the LN-PB3M. Luna Optics have left the binocular’s body exposed which is unlike most common daytime binoculars that are usually covered with rubber. This design gives them a tough, masculine look. They feel sturdier than a battle tank and are lighter than they look. This is despite the gadget being made from an all-aluminum body. The binoculars come in at 1.68 pounds or 760 grams. While this might seem a bit on the heavier side, it is the standard weight for the majority of full-sized binoculars. The built-in IR illuminator protrudes out of the body’s front and is located between the two barrels. The illuminator allows you to use the device in situations where the ambient light is not sufficient or when there is complete darkness. The illuminator emits infrared light reflecting it from the object you wish to view. The light is then amplified by the tube in a similar way ambient light is amplified. Next to the illuminator is the sensors which protect the gadget from damage that might arise from exposing the sensitive internal components to bright light. 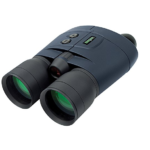 Additionally, the Luna Optics 3X42 Premium Night Vision Binoculars are weather resistant. However, this does not mean they are fog or waterproof. You should take this into consideration if you plan on using the device in extreme weather conditions. Most people who consider buying night vision binoculars or goggles do not consider the eye-cups. These are usually underestimated and overlooked. Most people only realize the importance of the eye-cups after buying a device with uncomfortable eye-cups. They are important as they are the point of contact between your face and the device. The eye-cups on the Luna Optics LN-PB3M Night Vision Binoculars are great. They are made from a type of rubber that feels like plastic. At first, this may put you off. When you place them on your face, you will realize they are a lot more comfortable than they look. In addition, the cups have ‘wings’ on their sides. These ensure external light is prevented from disrupting your view or entering from the side of your face. When it comes to focusing, every barrel on the binoculars is focused individually. You can do this by twisting the end of each barrel to focus on an object. This means that it will be a slow process even though it only takes half a turn to go from focus to infinity. Compared to a conventional central focusing binoculars, this is slow because you need to focus each lens individually. Every ocular lens (eyepiece) can also be adjusted on its own using a ring located under the eyecup. The ring is crucial in setting up the night vision binoculars to suit your preferences. One of the best ways to focus each piece would be closing one eye, focusing the opened eye to your preferences, and repeating the process with the other eye. Generally, the light gathering potential of your optics depends on the size of the objective lens on your device. The larger the objective lens, the more the light gathering potential. The 50mm objective lenses on the Luna Optics LN-PB3 Night Vision Binoculars give the device a higher than normal light gathering potential. Although giant objective lenses are ideal, they have a downside. They are far more expensive to manufacture and will marginally increase the overall size of a pair of binoculars. The Luna Optics LN-PB3M Night Vision Binoculars seems to have gotten the balance just right. 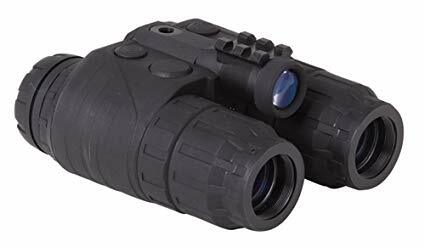 They are not only compact enough to be ferried easily around but also have more light gathering potential compared to the majority of full-sized binoculars which usually have 42 to 43 mm. The LN-PB3M offers one of the highest quality images you may come across in the market. 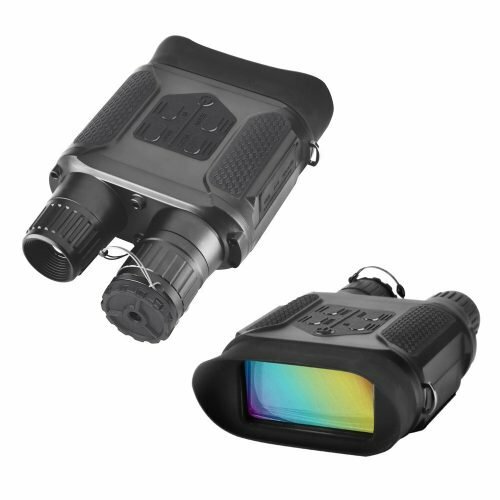 It uses intensifier tubes which amplify ambient lights to almost nine hundred times and high-resolution, top-grade first generation night vision technology. The relatively low cost of these tubes has made them the most used products in most general consumer devices. 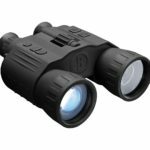 The Night Owl Pro Nexgen Night Vision Binocular offers the trademark Night Owl quality and ease of use without a price tag that is going to put you in debt. It is certainly not the cheapest night vision binocular on the market, but you do get plenty of value for your money. The 5X magnification is probably more than you would need while operating in the dark and the binoculars work great even when only using ambient light thanks to the image intensifier tubes. Switch on the built-in infrared illuminator and you will get an even better range in total darkness. The Pro Nexgen is larger and heavier compared to other binoculars in its category. You should keep this in mind, especially if you plan to use it for long periods of time. If you plan on using a tripod, this will not be possible as support for a tripod mount has not been incorporated into the design. However, using the Pro Nexgen is quite simple. The device has two main buttons. The first button is the power on/off button, which is used to turn the binoculars on and off. The other button is used to activate Infrared Red. The optics are made from high-quality glass to ensure a quality viewing experience. 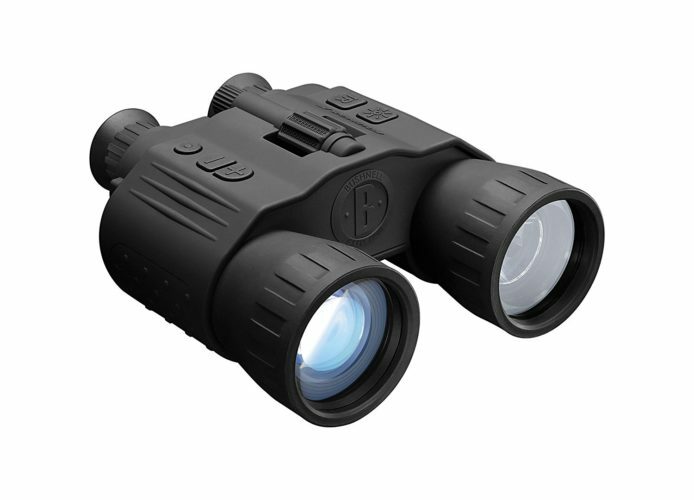 The binoculars have a soft-touch rubberized finish which makes it quite comfortable to hold. Durability is not an issue on this device because the lens housing is made using molded thermoplastic that is impact resistant. The end caps and eye caps are also rubberized for maximum comfort and durability. 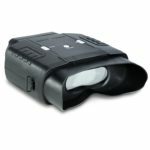 The Night Owl Pro Nexgen Night Vision Binocular also comes with a padded neck strap. This allows you to walk around with the binoculars around your neck, instead of holding them in your hands when you are not using them. If you have used standard or older version of binoculars you may find the location of the focusing knob – which is located on top of the housing – to be a little weird. Even though this takes a while to get used to, it should not be a deal breaker. The Night Owl Pro Nexgen looks professional and sturdy. This is something you want from a device if it is going to set you back several hundred dollars. Manufacturers of binoculars have been known to use cheaper and even substandard materials in a bid to save on production costs. In the long run, such a move can be costly. Since it is something that you will be mainly using in the dark, it makes perfect sense to go for a durable product such as Nexgen. One of the features that make these binoculars impressive is the clarity you get, even when you view your surroundings with minimal ambient light. Things get even better once you switch on the IR illuminator. The quality is so good on the Pro Nexgen, you might find it hard believing that the device uses generation 1 technology. When the IR is off, you get more detail and less distance. The range is increased when IR is on although the quality tends to reduce. Since the binoculars work well without IR, you do not have to use your batteries all the time. According to the manufacturer, you can have up to 80 hours of battery life with the Nexgen. It’s important to note that the Pro Nexgen uses the CR123A battery type, which does not come cheap. The Nexgen continues to impress with its 50mm lenses made from high-quality glass, durable casing, and comfortable design. About the only things that count against it are the fact that it is a bit on the heavy side and cannot be mounted on a tripod, but these are minor concerns when looking at the binoculars as a whole. 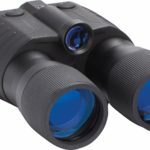 With all the great features and the reasonable price, the Night Owl Pro Nexgen is easily our top pick when it comes to night vision binoculars. 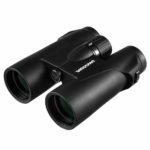 Additionally, 5X magnification is among the best offers you can ever get for any handheld binoculars sold at this price. 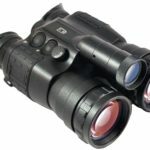 The Night Owl Explorer Pro 5X doesn’t come cheap, but if you insist on owning one of the best first generation night vision binoculars on the market then this is a very good place to start. It packs the expected 5X magnification as well as 50mm lenses. 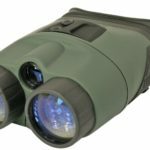 This binocular offers great image clarity thanks to the multi-element glass optics and is durable enough that it can withstand a bit of impact without crumbling. Due to the size and quality of the materials the Explorer Pro 5X also suffers from being a bit on the heavy side, but this is a small price to pay for all the features that it packs and something that you can get used to. 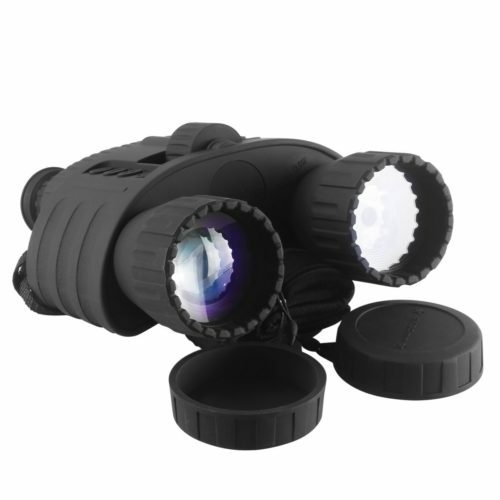 Among the Night Owl night vision binocular products, the Night Owl Explorer Pro 5X is among the top models. It has more or less the same design style you will find in other products in the same range. This means that it may not appear as flashy compared to some other products in its category. The Explorer cannot be faulted when it comes to functionality, durability, and comfort, which are the most desired qualities of binoculars. Durable lens housings are used to protect the 50 mm multi-element glass optics of the gadget. The housings are made from molded thermoplastic that is impact resistant. Housings made from such materials allows the product to take a few knocks and still perform optimally. This is an important feature for an item that does not come cheap. The body of the binoculars is made using a soft-touched rubberized finish. This allows for an easy grip even if your hands are wet or sweaty. It is also a great feature as it provides a comfortable hold. For ease of access even in the dark, the IR and power buttons are located on the top of the binoculars. Additionally, the central focusing knob is also placed at an easy to access location. Some people have stated that the weight of the Explorer Pro is more than that of some similar products. This is unavoidable due to the quality of the optics. If you are using this kind of binoculars for the first time you may not notice the weight. However, if you were using a light brand you will feel the difference immediately. The Explorer Pro is powered by a 3-volt battery. It offers decent battery life, though it is a bit costly and is not easily available in most general stores. The Night Explorer Pro 5X packs almost everything you might need in a first generation night vision binocular. To start with you will notice the 5X magnification. It allows you to get a good look at your targets even in the dark. It is currently the highest magnification in the Night Owl range. The glass optics are treated with fluorides and oxides to ensure maximum light transmission while simultaneously reducing the reflections on the glass surface. This explains why the Explorer Pro has such crisp viewing clarity. To ensure there is an effective use of ambient light there are two intensifier tubes in the Explorer Pro 5X. Combine this with an inbuilt infrared illuminator and you will get great nighttime performance even in complete darkness. Like other products from the same manufacturer, the clarity of the Pro TX is high even when the IR illuminator is switched off. If it wasn’t for the high price tag the Night Owl Explorer Pro 5X would have been our top pick, but as it is the Pro Nexgen from the same manufacturer offers a lot of the same features but at a much lower price. If you have the money to invest you can’t go wrong with the Explorer Pro 5X. Take note that the price will vary from one retailer to another. Due diligence will ensure you get the best price from a retailer. Bushnell has been in business for more than six decades and is a well-known name in the optics industry. 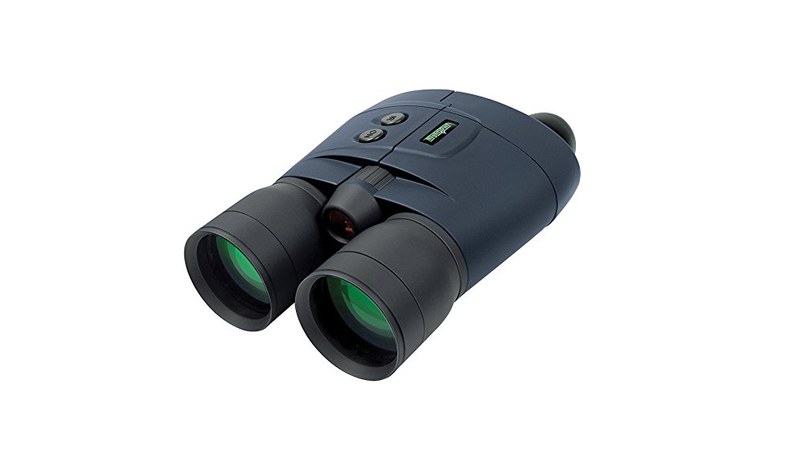 One of their best product is the Bushnell LYNX Gen 1 Night Vision Binocular, 2.5x 40mm. For starters, this device uses a generation one intensifier tube. This is combined with a powerful infrared spotlight. For binoculars where the infrared is not powerful, images seen in low ambient light will not appear as clear as they should be. This is the reason why a good night vision binocular needs to have a very powerful infrared spotlight. The viewing range of any binocular is quite important. Most common night vision binoculars usually have a viewing range of about 400 to 800 feet. The higher the viewing range the better. The Bushnell LYNX has a viewing range of 750 feet. This means that any object within this distance can be viewed clearly even in the dark. This is also a great distance should you be hiking or hunting at night as you will be able to have a wider view of your surroundings. The LYNX from Bushnell is weather resistant. This means it can withstand extreme weather conditions. The fact that it works well in heavy rain or snow and during storms makes it a preferred choice in law enforcement. It is also a preferred choice for wildlife surveillance and night navigation. The materials used to make the device ensure it is water resistant. You can, therefore, use it in wet weather conditions without having to worry about water damage on the gadget. When it comes to optical performance, the binocular is among the best in its range. It has a 2.5X magnification. 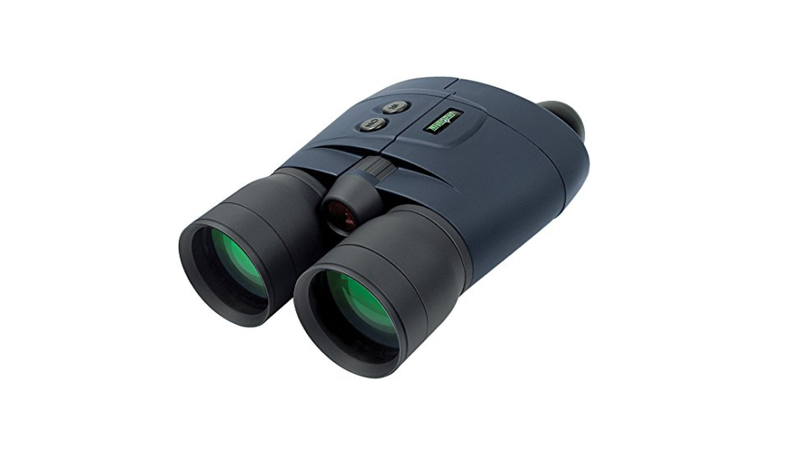 It beats most binoculars in this range, which has a 2.0 X magnification. This means the Bushnell LYNX has 25% more magnification when compared to other products in its category. The clarity of the binocular is further enhanced by a 40mm f/2.0 lens system. Combine this with a 1st generation intensifier tube and you are assured of clear images at great distances with minimal light. The clarity of images is further improved by the use of antireflection multi-coated glass optics. These particular optics increases the light transmission resulting in clearer images despite the low ambient light. The device is powered by two AAA batteries. The power consumption of the LYNX will be determined by two factors. The first one is the amount of time the infrared spotlight will be on. If you are going to use it for prolonged periods, take note that the device will consume a lot of power, resulting in a shorter battery life. The second feature that affects the battery life is the number of times you zoom in and out. Constant zooming in and out means constant adjustment of the lens. At the end of the day, a pair of triple a batteries will last anywhere between 20 and 70 hours depending on the use. One of the main benefits of this particular binocular is the weight. At only 17 ounces, it is lighter than most of the binoculars in the market. If you plan on using a night vision binocular for a long time, weight is a crucial factor to consider. Heavier makes and models tend to weigh you down in the long run. Another advantage of the binocular is the fact that it has a tripod mount. This can be great for people who plan on viewing a large area for long periods of time. When you look at the benefits and features of the LYNX, it is clear that it is a product that will give you great service. It is also recommended for people who love the outdoors but live in areas with a lot of rainfall and humidity. 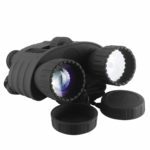 If you are a person who loves binoculars and night vision goggles, then you know the importance of getting one that you can use both during the day and at night. The Sniper Deluxe Night Vision binoculars offer you a fun and effective way to see in the dark. Just like other night vision binoculars, they have IR illuminators to enhance images even when viewing in complete darkness. 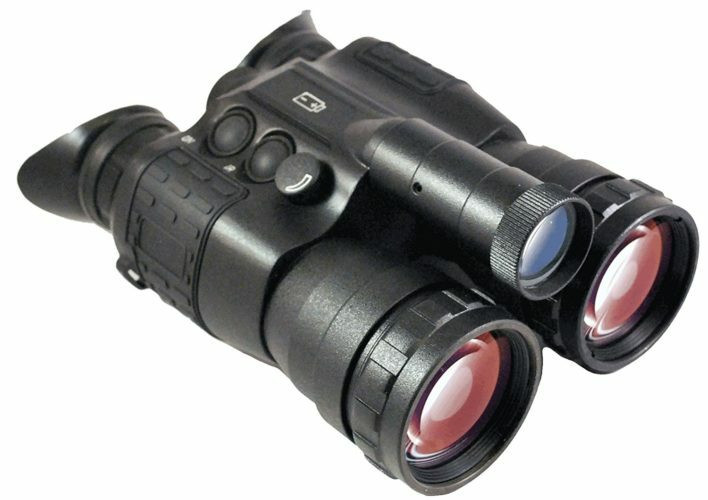 One of the key features of the Sniper Digital Zoom 2x Deluxe Night Vision Binoculars is the pair of unique illuminators, which can be adjusted to seven different levels, which go from the lowest to the highest. For most types of night vision binoculars, they commonly have IR illuminators with an on and off button. However, one that has different adjustable levels ensures you are able to view things at night using illuminator levels that are most comfortable for you and your viewing conditions. Seven levels are more than enough to make your viewing as pleasant as possible.The device also features a unique technology that is designed to enhance imagery in complete darkness. Combine it with the use of the IR illuminators and you will have the best viewing experience possible. Zooming is a crucial feature in any binocular. The amount of zooming a binocular allows will determine its effectiveness. 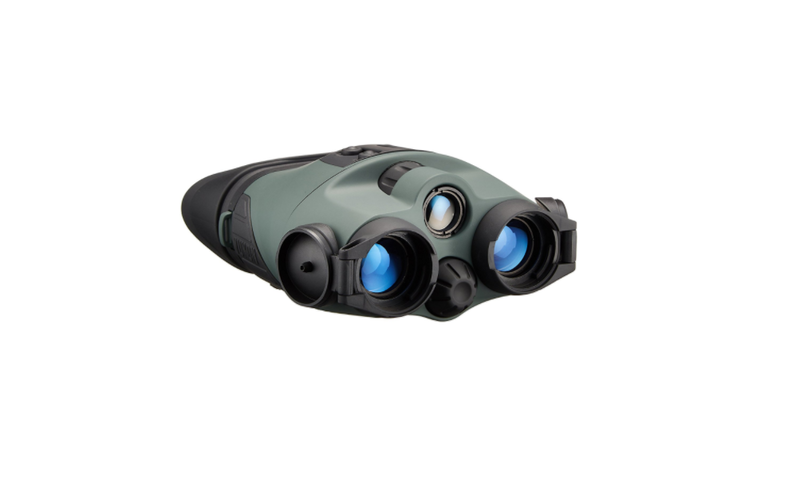 2X zooming is the common standard for most binoculars in the market, including the Sniper Digital Deluxe Night Vision Binocular. The zoom is digital which allows the user to get the best view possible. The user can also adjust the zoom anytime at the touch of a button. One of the features that make this particular product unique is its capability to record videos as well as take pictures. Not many gadgets or devices in the market out there have a similar capability. It is, therefore, a great feature to have in a binocular. Most other binoculars that support video are not very clear. It is common to experience blurs when viewing things in motion when you are using standard binoculars. Such problems will not be experienced when you are using the Sniper Deluxe Night Vision Binoculars. Video technology in the gadget ensures you can comfortably record any moving objects in the dark or during the day. A good number of night vision binoculars do not have the option of viewing in the daytime. They are mainly designed for viewing with minimal ambient light. As this is the case, people tend to invest in a day binocular and night vision binocular. The design of the Sniper Deluxe Night Vision allows users to have a great viewing experience both at night and during the day. In complete darkness, the user can view up to 110 yards. This is an extra 40 or more yards when you compare it to similar binoculars in the category. During the day, you can view objects that are as far as 440 yards depending on the amount of light present at the time of viewing. Clarity of images in any binoculars is determined by several factors. The first one is usually the aperture of the binocular. The Sniper Deluxe Night Vision Binocular has a large F1.4 aperture. It also has enhanced multi-coated lenses. These features allow the user to experience very clear images both at night and during the day. If you have a low budget or you are a beginner, this particular product will suit your needs. It is great for search and rescue, locating nocturnal critters and surveillance. The Sniper Deluxe Night Vision weighs approximately one pound. While it may not be the lightest night vision binoculars in the market, it comes with a neck strap. When you are not using the binoculars you can let them hang around your neck for hands-free convenience and to reduce fatigue associated with carrying the device by hand. It uses 8 double A batteries which are not included in the package. However, finding these batteries is easy as they are sold in most local stores. Bushnell is a company renowned for the manufacture of high-quality optical products, including night vision binoculars. One of its popular products is the Bushnell 260501 Equinox Series 6L Night Vision. The product has great handling, owing to its tough rubberized covering. This ensures a comfortable grip even when using the device for extended periods of time. Additionally, the rubberized covering protects the gadget from knocks resulting from dropping the device or other similar situations. Considering the price of the product, having such a covering is an added advantage since it enhances the durability of the device. The Bushnell 260501 Equinox Night Vision is not built for high-definition viewing. Despite not having 1080p HD, the images are still very clear. If you plan on taking photos and video, the resolution is sufficient and is quite good even at night. When you are using it at night, make sure you turn on the IR illuminators. They will increase the clarity of images even in total darkness. The illuminators should only be used at night because they have very little to no impact when used during the day. Make sure IR is turned off during the day to save battery power. The body of the Bushnell Equinox Series 6L is ergonomically contoured for a comfortable hold. It also has a rubberized covering which provides a non-slip grip. Menu buttons are arranged at the top of the device to ensure comfortable handheld operation. Their placement makes them easy to reach with your fingertips. The Equinox Series 6L has functions such as infrared brightness control, IR illuminator on-off, coarse digital focus and power on-off. Apart from the digital coarse focus, there is a wheel placed at the center that offers users a fine focus adjustment. The eye-caps on the gadget is also rubberized. The main aim of such a design is to provide the user with comfortable eye contact. If you plan on being outdoors for long periods, or you just want to keep your hands free, you can use the tripod mount to attach it to a tripod. If you are moving around a lot you can use the neck strap to carry the device when you are not using it. Most of the binoculars you find in the market today do not have a digital sensor. This is a feature that helps protect the intensifier tubes from light damage. The product also features an adjustable sensor brightness. This allows the gadget to accommodate varying ambient infrared illumination to give you the best images. Unlike similar products on the market, this one offers target illumination when the infrared illuminator is switched on. The purpose of such a feature is to provide the best image quality possible for a particular target. The Bushnell 260501 Equinox Night Vision is powered by 4 AA batteries. The advantage of these batteries is that they are available in local stores in most areas. The batteries are not costly and you can decide to get lithium or any other type that you deem fit. Take note the quality of batteries will affect how often you replace them. If you are going to use the device for extended periods of time, it would be advisable to carry an extra pair. People who have used the binoculars have stated that it can run for approximately 3 hours when it is using batteries. This means that you need at least two pairs if you are going to be using the binoculars for more than 3 hours. Though the device is quite pricey, its features are worth the investment. The main problem with night vision gear is that they are often priced way above what a novice hunter would be willing to spend. This is off-putting, and is one of the reasons why so many people go out under prepared. Thanks to Solomark, that is no longer the case. Night vision binoculars have been made affordable again.The Solomark Night Vision binoculars are a great tool to have, so let’s take a better look and see whether you should be getting them. With any night vision device, the primary thing you will be concerned with is viewability. The Solomark has that taken care of with a 3W, 850nm Infrared Illuminator. This lets you see at distances of up to 400 meters (1300 ft) in complete darkness. Considering this is actually far from a high-end device pricing, these are impressive numbers. What’s even more impressive is that they’re correct, instead of some budget options where you get claims that aren’t even nearly true in reality. You can use the binoculars during the day as well, and you won’t damage the optics. Without the suitable protection, using night vision devices during the day will completely ruin them in a very short period of time. As far as optical clarity goes, that too is impressive. You have up to 7x magnification in the darkness and 2x digital zoom. This might not seem like much, but when you’re hunting in the dark, you won’t be needing much more as distances are often shorter than hunting during daylight, and that’s not the only difference. You have a 31mm lens which lets in plenty of light, and this further enhances the viewability at night. The lenses are fully multi-coated, which severely decreases any glare, and the CMOS sensor will ensure that the picture you get is clear and sharp. The thing with the Solomark Night Vision binoculars is that their functionality doesn’t end with just “night vision binoculars”. We live in an era where smart modern features are added to things that were previously all analog. This is also the case with the Solomark which has a few smart features that extend its functionality beyond that of a regular pair of binoculars. One such example is the ability to record photos and videos. Yes, you can use it as a camera, and the files are saved to a micro SD card (one that you do need to supply) that could be anywhere between 4 and 32 gigabytes. This is excellent for hunters that want to review whatever it was that happened earlier, or for those who just want to share their experience with others. You don’t even have to record on an SD card, there is an AV cable which lets you output your footage to a TV. These are all features that you don’t find on any regular pair of night vision binoculars, so they’re absolutely welcome here, especially considering how good they work. If you’re a hunter who already has experience with hunting in the dark, you very likely know what you need, and might require something that has better quality optics and better performance. However, if you’re such a person you know that you should spend a bit more on such a device. On the other hand, if you’re someone who is just getting into night hunting, or just wants a backup device they can throw in their backpack, this is an excellent option. It has all the basic functionality, a bit of smart tech, and a price that puts it within reach of many. Sightmark’s Ghost Hunter 2×24 night vision binoculars are the next best feature on our list. Durability and affordability all rolled into one amazing piece of equipment. These binoculars are also available as a monocular, but we’ll be taking a look at the binoculars. They’re a bit easier on the eyes and more comfortable to use. They are a Gen 1 device that doesn’t break the bank but performs admirably as long as you set your expectations right. If you want to be able to look at 1000 yards in pitch black darkness, no, this won’t cut it. However, if you want something that lets you see what’s happening around you when you’re out hunting in the dark, do give them a chance. As mentioned, this is a Gen 1 device. That means you won’t get the insanely powerful IR illuminators of more expensive Gen 2 and Gen 3 devices. However, the IR illuminator actually works very well and lets you see your surroundings. The 2x magnification will bring things a bit closer to you. However, if you intend on putting these on a helmet for continuous use, that might be a downside. If you’re using them continuously, you’ll want to know what’s around you, not a bit further away, so 1x magnification is recommended. The image is actually clear, and anything that is in your vicinity will be well illuminated, especially if you have the moon on your side. Clarity and sharpness is something cheap night vision binoculars often compromise on in order to keep the costs down, but that’s not the case with Sightmark. So, where did Sightmark compromise? The next obvious choice after performance would be build quality. Fortunately, that is not the case. They’re built very well, and the polymer construction ensures that it doesn’t weight too much. They come with a carry case, ensuring that they are well protected when not in use. While we’re discussing protection, Sightmark added a nifty feature to the Ghost Hunter 2×24. A major problem for the tubes inside a night vision device is when they get exposed to bright light. Some brands solve this issue by placing a small hole in the lens cap, and you’re meant to use them with the cap on during the day. Sightmark opted for a different approach – the binoculars will switch off in case they’re exposed to light, thus protecting the tubes. As you’ve seen in the specs, there aren’t that many things to waste the batteries. Therefore, all you need to use the binoculars are two AA batteries. With them, you can expect around 72 hours of use without the IR illuminator. Of course, if you do activate it, the usage time will be significantly less, which is to be expected. There is one thing that’s worth mentioning that might make a difference to some. The Sigthmark Ghost Hunter is restricted for sale in the State of California, or outside the US. This means that you won’t be able to get it in these places, but if you’re living anywhere else in the US, you should be good to go. The Ghost Hunter 2×24 binoculars are definitely something to consider. They may not be as good as a high-end Gen 3 device, but you’re getting them at something close to 5% of the price of that Gen 3 device. 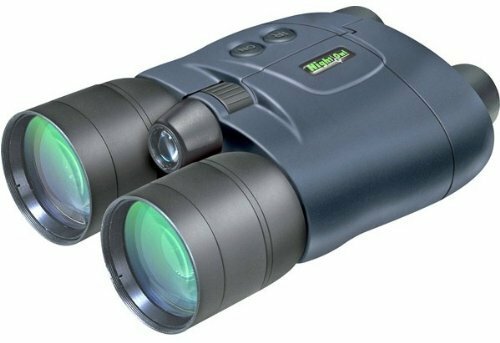 The Yukon Tracker 2X24 is another night vision binocular that is a bit more affordable than similar products on the market while still offering great performance. It loses out against the Night Owl Pro Nexgen because of its lesser magnification and smaller lens diameter, but when it comes to quality and durability it is hard to beat. 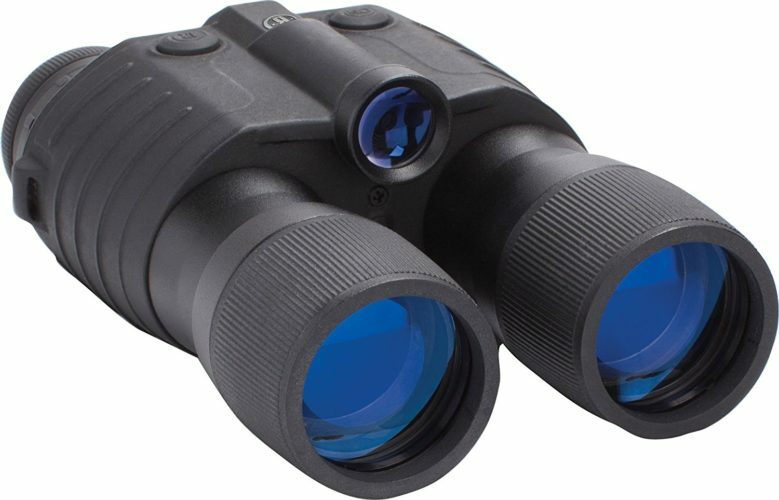 It is also a versatile product as it features pin holes in the lens caps which allows you to operate the binoculars during the daytime, something not commonly seen on night vision products. The Yukon Tracker is a rugged product that you can take out into the wild with you without worrying that it is not going to withstand the elements. It has rubber armor for protection and is weather as well as drop resistant. The image quality is quite good despite the fact that the magnification is not as high as other night vision binoculars and it also has a reasonable battery life, which can prevent you from being stuck in the dark due to a flat battery. If the magnification and lens were better for the price the Yukon Tracker could easily have been a top contender, but as is it is beaten to the position by the Night Owl Pro Nexgen. 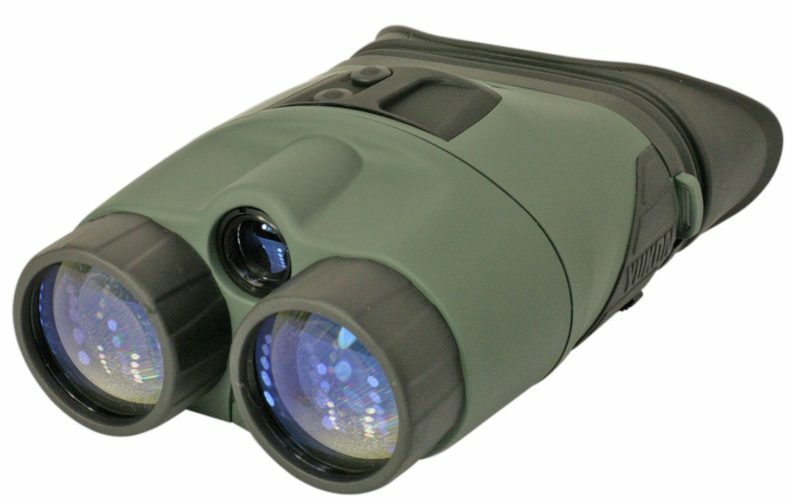 The Yukon is a sturdy and well-designed night vision binocular that has greatly impressed its users. One of its impressive qualities is its weight. Some of the products in the market are heavy and will weigh you down when you are out on the field. When you use the Yukon Tracker you will notice this is not an issue. The Yukon Tracker is lighter is due to the fact that it uses smaller lenses as compared to similar night vision binoculars in the market. The lenses are fully-multicoated and made from high-quality optical glass, which means quality has not been compromised. Even though it is drop-and weather resistant, the price should be enough to make you handle it with care and keep any accidents to a minimum. This particular product is not waterproof. If that is an issue, you should consider getting a version of the Tracker that is IPX5 compliant. The Yukon Tracker is lightweight and comfortable in the hands. Additionally, it is highly durable as a result of the rubber armor around its body. Flip-flop lens caps are used instead of the typical lens caps, which are problematic because they are usually fastened with strings, are easy to drop in the dark and are usually loose. Flip-flop lens caps are convenient and easy to operate as they are folded back against the binocular’s body. The focus knob is easy to operate in the dark because it is located close to the center of the housing. An interesting feature is small pin holes in the lens caps that allow people to use the device during the day. The package is inclusive of a protective carrying case and neck strap, but not inclusive of the CR123A battery. The lower price of the Yukon Tracker might be due to the fact that it uses one first generation intensifier. The lenses offer decent range despite them being 24mm. The IR illuminator can provide coverage of up to 150 yards. The device works great when ambient light is low. However, you can use the pulse IR system infrared illuminator should you be using the binocular in total darkness. The Tracker has a magnification of 2X which is less than half what you would find on high-end night vision products. All the same, when you consider the price, it provides good value for money especially if you do not need the extra magnification. You may notice that you may need to do more refocusing as you use the Yukon Tracker, though this should be a relatively minor issue. Yukon states that users should expect approximately 20 hours of battery life when using their binoculars. The duration will be determined by how often a user uses the night vision binocular with the IR illuminator switched on. The Gemtune Best Guarder WG-80 5MP 450mm HD Night Vision Binocular has some amazing features that make it a good choice for people who are looking for good binoculars for both daytime and nighttime use. The Gemtune Best Guarder WG-80 features high-performance 5MP night vision capabilities. The image clarity is improved by the use of built-in IR illuminators. It also has a 1.5-inch color LCD screen. Apart from being binocular, it can also be used as a real-time surveillance camera, camcorder, camera or telescope. However, real-time surveillance is only possible when it is connected to a monitor or computer. Observing distance is an important feature of any night vision binocular. The Gemtune Best Guarder has an impressive viewing distance of 300 meters or 984 ft at night. During the day the distance is more than five times at 1500 meters or 4920 feet. This is very impressive especially when you consider that the Gemtune Best Guarder WG-80 5MP can be used both during the day and at night. A good number of binoculars with such capabilities usually have short observing distances. Many of them have an observing distance range of between 400 to 800 feet. Take note the observing distance will vary depending on the weather conditions and amount of ambient light during the day or night. All the same, such observing distances are not common in most binoculars, which makes the Gemtune Best Guarder one of the best you will find on the market in this regard. The best observing distance of a Binocular refers to the distance that allows you to get the best view. The Gemtune Best Guarder WG 80 5MP 450mm HD Night Vision Binocular has the best observing distance of 6.5 ft. to 1640 ft. or about 2 meters to 500 meters. At night this distance is considerably shorter due to the lack of sufficient light. However, it can still manage the best viewing distance of 150 meters or 492 feet, which is still quite impressive especially when you consider that majority of night vision binoculars have a viewing distance of fewer than 100 meters. This means an extra 50 meters of viewing that you may not get when you use other types of binoculars. The Gemtune Best Guarder has a 5x magnification, which is one of the highest magnification levels that you will find in the market. Take note that the majority of the night and daytime binoculars have a magnification of between 2x and 4x. 5x magnification means you get to view things that are far away with more clarity than you would with a binocular with less magnification. Additionally, the device has 720P video recording capabilities. For instance, if you were looking at wildlife during the night and you stumbled on a great view, you can video record it at 720P. Even though this might not be the best clarity in the market, it is quite impressive as it is one of the highest you can ever find. Another advantage is that the device supports time-lapse function which photographers and videographers will find useful. GPS ID stamp is also available when you are viewing and recording video. If you do not have this information, you can easily enter it manually. The device has enough illumination to allow you to use it comfortably even in dark environments. The Gemtune Best Guarder WG-80 5MP 450mm HD Night Vision Binocular has a menu that supports different languages including Polish, Czech, Spanish, Italian, Japanese, Russian, French, German and of course, English. The device weighs 780g or approximately 1.6 pounds. The package includes a carrying bag and belt as well as a cleaning cloth, USB cable, and AV cable. 4 AA batteries power the device. Users are advised to use alkaline batteries for optimal performance. Other than eyeglasses, binoculars are the most used optical instrument in the world. Ever since the advent of night vision technology 60’s, the popularity of night vision binoculars has grown tremendously. Since they have many uses, choosing the right gadget for your specific application may be a daunting task. 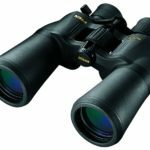 However, there are some tips in this guide that can help you choose the best night vision binoculars for your needs. Your choice should be based on how often, where and when you plan on using the night vision binoculars. 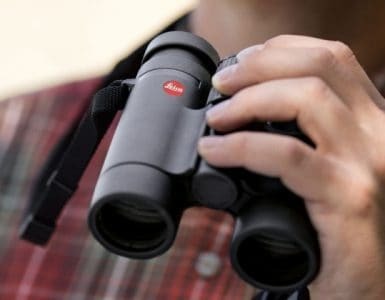 When you decide to purchase night vision binoculars, you should consider the following features to ensure you get a device that satisfies all your needs. When it comes to choosing the right night vision binoculars, the size, weight, and ease of use are major factors that you should consider. If you get a unit that is non-user friendly and is uncomfortable to hold, it will not be beneficial to you. For example, if you plan on being mobile when using the device, you need to get one that is light and small to ensure you are comfortable when using it on the move. If you plan on using a night vision binocular from a static position, then a larger model with more features will be more suitable. Focus control, switches, and model need to be strategically positioned for ease of use irrespective of the make and model. The human eye is confined to a small portion of visible light which is referred to as the electromagnetic spectrum. A night vision binocular helps you see better in low-lit situations by enhancing the nonvisible source of electromagnetic radiation. It does this using infrared illuminators, which shine a beam of infrared light which can then be picked up by the binocular optics. Before purchasing night vision binoculars, ensure that they have IR illuminators, which makes them suitable for use even in areas with low ambient light or complete darkness. Resolution is a common term in any device that is used for viewing. The resolution affects the image quality of your night vision binoculars. Therefore, before buying one, you should take this into consideration. The higher the resolution on a device, the better the resulting image. Ideally, you should go for the highest resolution within your budget. It’s also important to note that resolution tends to deteriorate as you move from the center towards the edges of the image. This determines the ability of the night vision device to bring far-off targets closer and make them appear to be bigger. The higher the magnification, the easier it is to see far off targets in great detail. For instance, for a device with 7 times magnification, the object can be made to appear 7 times closer than it would be when seen with your naked eye. A duck that is 100 yards away would appear as though it was 14.3 yards away (100 divided by 7). Take note any night vision binoculars with more than 10x magnification will amplify your hand’s movement, making it difficult to have a steady viewing. It is the distance between your eyes and each eyepiece while the entire field of view is visible. Comfort is increased by long eye relief since it allows the user to hold the instrument away from their face. This feature is most useful for people who wear glasses. The majority of night vision binocular manufacturers advise glass wearers to roll down the rubber eyepiece collars before they use the gadgets. Take note that some exceptions exist depending on the gadget of choice. If you wear glasses then look for a night vision binocular with eye relief of at least 11mm. This is the width of the area that is visible in front of you without having to turn your head. Field of view is measured in degrees. The wider the field of view, the bigger the area you can see through your night vision glasses without turning your head. A wide field view is the best to identify and find fast moving objects like birds. Usually, a narrower field of view is the result of a higher magnification power. Most night vision binoculars will allow you to adjust the focus of the device. For most of them, there is a central focusing wheel that is used to focus both barrels at the same time. They may also have a diopter adjustment ring used to focus every barrel independent from the other. The system is used to compensate for any differences that may occur between your eyes. A diopter ring will be usually found on either the right or left barrel near the eyepiece. Some of the light passing through night vision binocular’s lenses is reflected away. It may be light from a street light or the moon while you are using night vision binoculars. This reflection can cause an image to appear dark as it reduces the amount of light passing through the lenses. Coatings are applied to ensure sharp, clear images while reducing reflection. Fully multicoated lenses increase light transmission and reduce the most reflection. If you plan on using your night vision binoculars on a rainy day or aboard a boat, you need to consider water-resistant or waterproof binoculars. The latter creates a seal preventing moisture from entering by using O-rings. They also prevent small debris or dust from entering the instrument. Weather-resistant binoculars are not necessarily waterproof. These are designed to protect against a little rain and cannot withstand submersion. Binoculars are likely to fog up when they are moved between different temperatures. For instance, if you move them from the outdoors at night to a warm environment like your house. Fogging can be potentially damaging if the moisture is trapped inside the device, not to mention it is annoying. Manufacturers of night vision binoculars counter fogging by coming up with methods that ensure the air inside the optic barrels is replaced by an inert gas which does not have any moisture content. This will ensure the gas does not condense. Such a move ensures the internal lenses are not susceptible to fogging.